A portrait of a beloved, influential American author, and the story of the more than three decade odyssey to complete it. 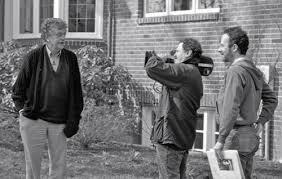 In 1982 documentary filmmaker Robert Weide contacted Kurt Vonnegut, proposing that he make a documentary about his life and career. Securing the author’s permission, the project commenced in 1988 – but what was intended to be completed in short course carried on until Vonnegut’s death in 2007. Over the intervening decades, the filmmaker and his literary idol became close – so much so, that the meta story of their friendship eventually found its way into the project, spurring Weide to complete the film with the assistance of filmmaker Don Argott. Weide and Argott are nearing the end of a Kickstarter campaign to allow them to finish the long-gestating project. At the time of this writing, they’re closing in on their goal, having received over 80% of their $250,000 target so far. With just over a week and half to go before the deadline, there’s time for interested readers to contribute. For more information about the project, check out its website. Vonnegut was the first author whose work I became obsessed with as a teenager, so, on a personal level, I’m extremely curious about the insight Weide gained about the author’s life and work through their decades-long collaboration. The fact that Weide was also behind Larry David’s CURB YOUR ENTHUSIASM as a director and executive producer promises a knowing appreciation of Vonnegut’s sense of humor and satire. While I’m typically extremely wary of meta elements to nonfiction projects, it’s a welcome sign that Weide has brought in Argott, himself an accomplished documentarian (LAST DAYS HERE, THE ART OF THE STEAL, and ROCK SCHOOL, among others), to oversee this element, who will hopefully providing some distance. At the same time, it’s the rare project that is crafted over such a lengthy period of time, so in this case, focusing some attention on the story behind the story seems justified, and, as the filmmakers note, at least in the case of Vonnegut, meta-textuality is a defining characteristic of his work, so this aspect should have a direct resonance with the film’s ultimate subject.